This past weekend, my family and I traveled to Aspen, Colorado to escape this torturous Texas heat of 110 degree F temperatures. We thoroughly enjoyed waking up to a crisp 42 degree morning, and 82 degree high in the afternoon. Every morning, my sister, her boyfriend Colby, and I would wake up around 6:30 – 7:00 and head out to run 6 miles (Colby ran about 10 miles) along the Roaring Fork River in Aspen. After returning from our run, we would always be starving. For three days in a row, we (actually my parents…I have to give them credit) made all of us breakfast tacos. I must admit, I have not eaten sausage in over two years. Back in January of 2009, I gave food poisoning to my husband, Matt, from two week old sausage! Poor Matt, I caused him to lose 11 pounds in 12 hours. hehe 🙂 Ever since then, he has not eaten sausage, and I don’t blame him. I thoroughly enjoyed these breakfast tacos, especially the sausage, every morning! These breakfast tacos were a weeknight “breakfast for dinner” tradition that my family and I enjoyed making while I was growing up. If you want to change up the recipe, you can substitute bacon for sausage, add cheese, salsa, and/or jalapenos if desired. We usually make these breakfast tacos just as you see here. 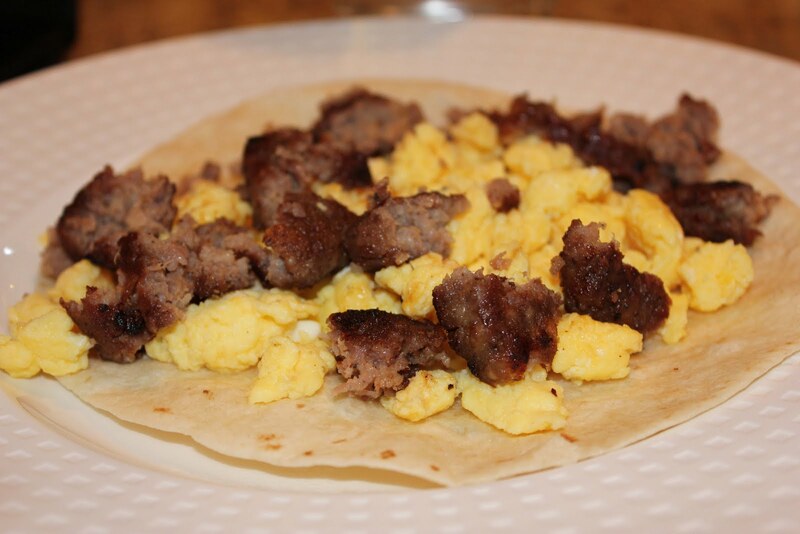 Plain and simple…eggs, sausage, and tortilla. P.S. Our hotel, the Hyatt Grand Aspen provides spacious kitchens with Viking appliances, Le Creuset skillets and pans, Wustof knives, a complete place setting of plates, mugs, and cups, and plenty of utensils. This is our favorite place to stay in Aspen… plus it is gorgeous on the inside! You can rent a unit with a spacious kitchen as seen below. Cook the sausage over medium-high heat until well done and no longer pink. Drain sausage on a paper towel. 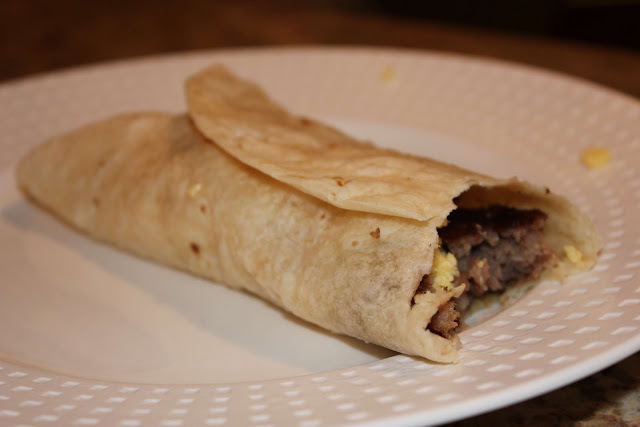 Place scrambled eggs and sausage into a flour tortilla. 1. 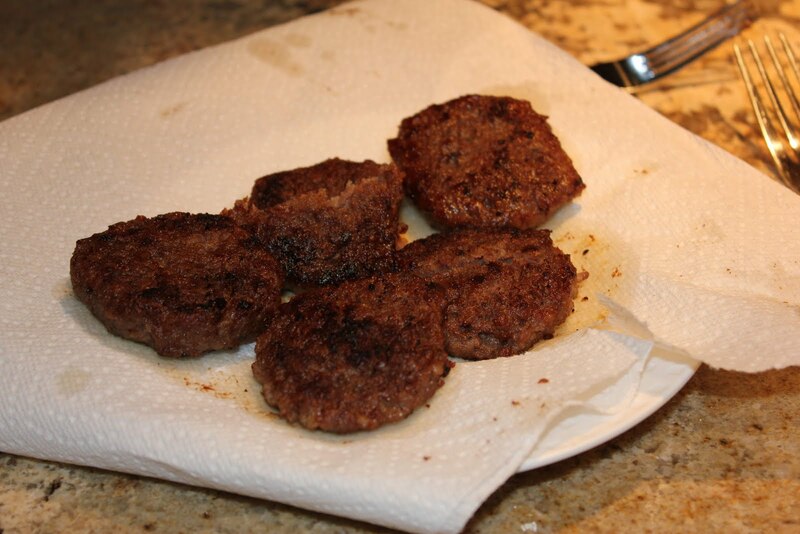 Slice sausage into sausage patties and cook on both sides over medium-high heat, or until no longer pink in the center. 2. Place cooked sausage on paper towels to soak in the extra grease. 3. 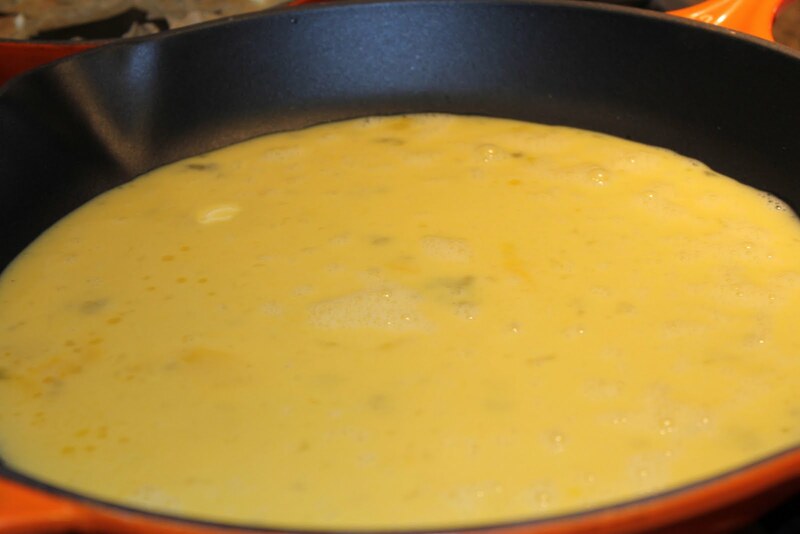 Meanwhile, scramble the eggs. 4. Warm tortilla in the microwave for about 20 seconds. 5. 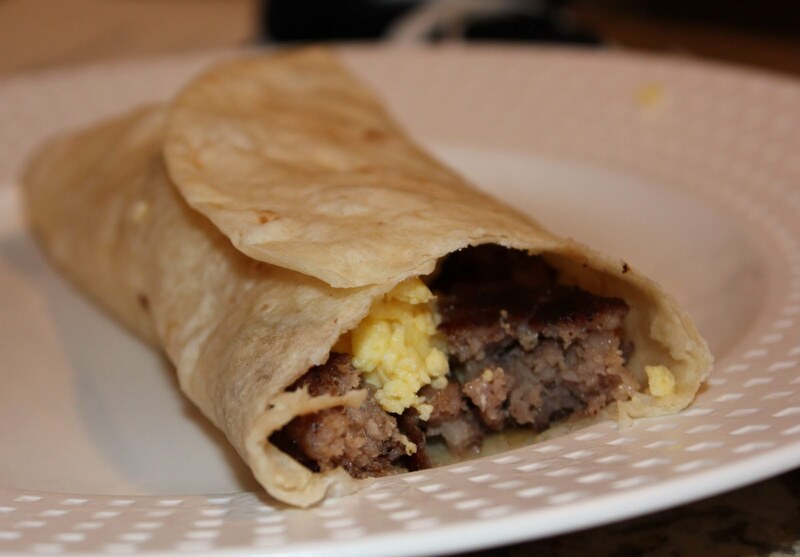 Spoon eggs and crumbled sausage over tortilla and roll into a burrito.